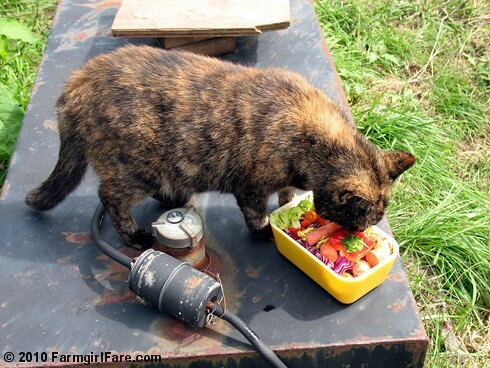 Farmgirl Fare: Saturday Dose of Cute: Chicken Food Thief? Our golden retriever dug out and ate every last carrot from my garden. He was in the proverbial dog house for days! Our friends had a yellow lab that just loved carrots! At one party he knocked a whole relish tray off the table just to get to the carrots!! Dogs and veggies I understand. Our beagle (who lived to be 15) was crazy for string beans and carrots. My Yorkie (4 pounder) adore iceberg lettuce and barks wildly for it. He will not touch the healthily green lettuce. But a cat with its nose in a dish of veggies? WILD! Had to laugh at the dog story. I've known several dogs who loved vegetables (not just carrots either). One would do a little happy dance when you offered him one. But my dogs, not so much. Loki, my crazy healer/lab/border collie mut cross will politely take what you offer him, and just as politely gently spit it back out and look at you like, "what the heck were you thinking". I have a cat who will take your arm off for cheese, and two othere who could care less. Animals, like people, are not all created equal. I love reading your Copyright notices - I learn sooo much from them! My dog (a Bichon) loves carrots - especially if I grate them for him! Aren't animals funny? Your wonderful photos of your crazy farm life AND the copyright notes are what keep me coming back again and again! I love the copyright notes. Took me a few blog posts when I originally found you to figure out that they were something you wrote, and now they're a cute, quirky part of your blog that no one else I follow does. Our dogs ADORE veggies, especially carrots, so I've always thought that's normal. Our cat? She must be part dog and loves bread, veggies, yogurt, any sort of meat...the only things we've found that she won't eat are cheerios and grapes. Odd. We have a Newf and a New/Border Collie mix who both LOVE carrots. We grow them in the garden just for the dogs. But the Newf will only eat them if they are peeled! So we always have a container of carrots in the fridge and they get pieces with every evening meal. My male whippet loves carrots and broccoli... when he hears me chopping veggies, he quietly sits at my feet until I notice him. My female will only eat meat products...and not so quietly will sit at my feet when she smells chicken! They are so funny and unique. I recently discovered your blog via npr.org. I really enjoy checking in once in a while. Hopefully I'll be able to try one of your recipes soon. I also have an adorable tortie shell named Lisa who has the same camera poses as Topaz. I saw my sisters 2 little dogs eat tomatoes the other day. Our dog Lena (a Norwegian Buhund) LOVES to eat the following raw foods: the crunchy parts of Romaine lettuce, cabbage, carrots, celery, broccoli, cauliflower, tomatoes, potatoes white and sweet, apple, pear, green beans…. and I'm sure that I'm leaving some out. [She does NOT like bananas, oranges or onions. One day I left an orange peeled and wrapped in two paper towels. She ate the paper towels and left the orange.] When I go in the kitchen and start chopping, she sits hopefully at my feet, waiting for something to be thrown to her which she will catch before it hits the floor. Thanks for all the fun comments! I love hearing about the vegetables and other foods your pets like to - or won't - eat. It's not surprising, since she LOVES tortilla chips. I've actually busted her jumping onto the kitchen counter to steal chips out of a bowl. I couldn't figure out what the heck she was after. Watching her enthusiastically crunching on them is a riot. I have a geriatric Jack Russell who loves asapargaus and goats that literally swoon over Doritos! And I love you ever-changing coyright notices! !